Time to get excited about the 2014 World cup in Brazil! Why the UK Staycation is here to stay in 2014 and beyond! I have just returned from a holiday in beautiful Dorset, where the sun (mostly) shone and where the staycation is obviously thriving, judging by the busy holiday park where we stayed and the number of happy tourists thronging the attractions that we visited whilst there. Dorset is rising in popularity in the staycation stakes, according to a survey last year by the Travelodge chain of hotels, who surveyed 3, 000 Britons to investigate their holiday plans for 2013. Dorset is placed at number 6 in the survey’s top 20 UK locations, up from 14th the previous year. Its rising popularity could be attributable in part to the phenomenal success of the TV show Broadchurch, where the series was filmed. Find out more about Broadchurch and its links with Dorset here. There are a mixture of cosmopolitan cities, seaside holidays, and rural countryside destinations in the Top 20, which clearly illustrates the myriad of great places there are to visit in the UK, offering great variety in terms of character, attractions and landscape to the discerning UK holidaymaker. There is literally something for everyone, and with last year’s good Summer in mind, many of us are opting to take a UK break either in preference to, or alongside a break abroad. The survey found out that 65% of British adults in 2013 chose to take a holiday in Britain – a massive increase from the previous year when 41% of Brits chose to holiday in the UK and from 2011, when 35% of adults holidayed in Britain. A third believe that it is cheaper to holiday in the UK, and feel that they get better value for money. The average foreign holiday cost quoted in the report was £1, 010.00. The greater cost of a holiday abroad is obviously a compelling factor following the financial downturn of the British economy and the impact on personal finances. Additionally, a third of Brits want to do our bit to support the British tourism industry and boost our national heritage by holidaying closer to home. The importance of a holiday is underlined by the 27% who stated that a holiday is one of the few things that they refuse to cut back on, even in times of belt-tightening and budgeting restrictions. Find out the identity of the other staycation locations in the Top 20 here, and read more about the findings of the Travelodge 2013 survey. Get a more up-to-date list of the Top 20 Easter 2014 staycation destinations here. Another interesting statistic from the Travelodge survey was that a fair proportion of UK travellers were planning a holiday that included more than one generation of their family, which could be linked to the 20% whose holiday choices are governed by nostalgia. Our family trip away included three generations, as it consisted of our family, my brother and his family and also my parents. Perhaps wisely, we opted for separate accommodation for different couples/families to allow for a bit of space, whilst providing the option of joining together for outings and fun. On the first night of our holiday we stayed in a Bournemouth Premier Inn – which gets very good reviews on Trip Advisor, and the rest of the group stayed in a small B&B called Marlins which was near the seafront and the town centre. It was a quiet and homely setting, where stags and hens are not de rigeur. My brother was lucky enough to have a family suite with the kids in an adjoining room with their own TV, always a crowd pleaser. He also reports that the breakfasts were very tasty, and as a foodie, he can be quite difficult to impress! Our Premier Inn did what it says on the tin and was a comfortable budget-priced stay – albeit somewhat fraught due to us all sleeping in one room, which never really works, as it’s a case of everyone having to have the same bedtime. Although, after a tiring journey, we wouldn’t have been too far behind the kids anyway. Our breakfast was tasty and good value, as the kids ate for free, and it was an all-you-want-to eat buffet where you were spoilt for choice – I even got my vegetarian sausages! That set us up for the day ahead, and even the fussiest of eaters found plenty to tempt them. Bournemouth boasts lovely sandy beaches, as well as a pier and lots of seafront attractions, our walk along the prom was bracing, but you could see the potential for a warmer day. As it was a bit nippy, somewhere indoors with something for the kids to do, was definitely appealing, so we paid a visit to ‘All Fired Up’ which is a lovely combo of a coffee-shop and a decorate-your-own pottery studio. I can definitely recommend their decadent but delicious ‘whole-bar-of-chocolate’ range of hot chocolates, enjoyed by both young and old. The kids enjoyed decorating the initial letter of their name, choosing their paints and stencils – and were able to take their creations away with them, after they had dried – well nearly! After a night in Bournemouth, we moved on to Poole, and more specifically Haven’s Rockley Park caravan park. We stayed in a Deluxe Plus caravan and were very pleasantly surprised by the space and quality of the furniture and furnishings – and it was great to have an en-suite and also a terrace. There was great attention to detail – with ornaments, books, and even a washing machine – which was very handy with the amount of dirty towels generated! The Park itself was just a short walk away from a picturesque harbour beach and a Nature reserve, and everywhere was kept spick and span and well-maintained, with very little litter to spoil the aspect. Facilities on-site included a small playground (although another was being built as we were there), a sports surface (for bowling etc), crazy golf, eat-in and out establishments, an indoor swimming pool with flume and water slide (top tip – get there early, as numbers are restricted, which leads to long queues at peak times). There was also a selection of kids clubs on offer, as well as evening entertainment, which the kids became immersed in very quickly. All kids love a bit of healthy competition, and they loved the healthy blue/yellow team rivalry overseen by endlessly energetic Funstars, who were just about on the right-side of crazily anarchic and organised various fun challenges and competitions for the kids to enjoy. 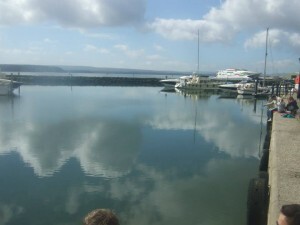 We also ventured further afield than the Park, as Dorset itself has a wealth of attractions for all ages and interests. It has beautiful beaches, harbours and islands, as well as chocolate-box countryside and villages, the setting for rich history and culture – including the UNESCO World Heritage site of the fossil-rich Jurassic coastline. Find out more about holidays in Dorset. Great for lovers of the outdoors, with something for all ages and interests. There is of course the Forest itself – with opportunities for walking, running and cycling, but there are lots of other options too. At the moment, there is a Percy the Park Keeper Family Trail, inspired by the charming books of Nick Butterworth, to add a further element of interest to your ramble. 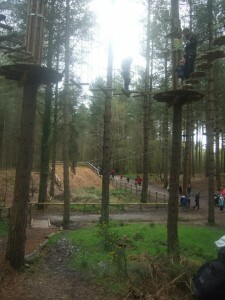 There is also the chance to Go Ape by taking to wooden platforms amongst the trees and challenging yourself to complete the assault course. My son and his cousins had a great time doing the Junior Go Ape course, with the highlight being the exhilarating zipwire descent through the canopy to the forest floor. My daughter loved our nostalgic ride on the Moors Valley Railway on a miniature steam train, chugging alongside the fishing lake, complete with tunnels, bridges and great views as we went. There is also a Play Trail, a Tree Top Trail and two play areas – which the kids all loved – they had the choice of the Adventure Play Area designed for older children, or the Castle and Sandworks Play Area, which is more suited to little ones. Travelling by boat to Brownsea Island is a bit like travelling back in time and you can leave the stresses of modern day life behind you, as you explore this peaceful and beautiful natural haven for wildlife. Apparently, the island was the inspiration for Enid Blyton’s Kirrin Island, and you can see how it’s ruggedly unique landscape could inspire the imaginary and poetic. 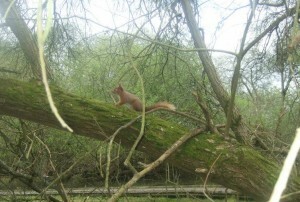 It has woodland, heathland, a lagoon, beaches and is home to the rare red squirrel. We had great fun trying to spot one of the 200 who live on the island, and did catch sight of a handful of the endearing creatures – you’re guaranteed to see a clutch of fluffy toy ones in the gift shop on the way home – a sight that filled my little girl with great joy. It is also no great surprise that the island was the site of the first Scout Camp, led by Baden-Powell, back in 1907, and is still home to the Baden Powell Outdoor Centre. In contrast to the olde-world charm and tranquillity is the location where we caught our boat from the island – Sandbanks – populated by the ostentatious homes of the very wealthy – great to have a nosey and take your virtual pick of the amazing homes in the area. Apparently the ruins of this castle were another point of inspiration for the classic children’s author Enid Blyton, and again, it’s easy to see how the remains of this medieval edifice could inspire the literary creation of Kirrin Castle. High on a hill surrounding the lower- lying village and surrounding countryside, it still dominates the landscape, and offers great views when you have ascended the hill to its highest aspects. For someone who comes from Hastings, it is interesting that the Castle was built by William the Conqueror, after he swapped a castle in Gillingham, Kent for the land which the castle stands on, and he then built it – the benefits of having a castle on such a high hill, are obvious – and it has seen its fair share of drama and warfare in its 1000 year history. Even though much of the castle is ruined, what remains is still impressive in its scale and there are enough bits intact to allow for interesting exploration – even without the castle itself – the views are fantastic. When we were there, there was an activity trail for children where they could gather information about the castle’s history at information points dotted around the grounds, and receive a real plastic medal at the end. 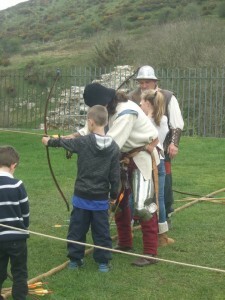 There was also the opportunity to try your hand at some medieval archery, and sharpen up your bow and arrow skills with some on-site tuition and practice. We all really enjoyed our UK staycation in Dorset, but I am also looking forward to my forthcoming holiday to Spain, as it will be the first time that we have had a holiday including all of the family abroad. A staycation is lovely, and it is great to appreciate and explore different places in the UK, but it is still an aspiration for many to hop on a plane and enjoy a holiday overseas. Personally, I am hoping for guaranteed sunshine, a sandy beach and a touch of culture in Barcelona…staycation or jet away? I vote for both!